Extract and Convert Microsoft Outlook Email: Should you upgrade to Outlook 2013? Should you upgrade to Outlook 2013? In July, 2012, Microsoft released a preview copy of MS Office 2013 which gave us our first peek at the latest version of the flagship office productivity suite. The new MS Outlook is not a radical departure from the comfortable Outlook 2010 experience so many of us are familiar with, but it is an overall sleeker, cleaner, and more efficient version. It also contains several new features worth taking a look at while deciding whether it’s worth the upgrade. There are a few noticeable visual changes to the new Outlook. The program now has a Metro twist to match the style of Windows 8, a style with a signature "flat graphics." The Outlook email view window has been reduced from four panes to two. One pane shows your inbox, and the other is for reading. Replying to messages has been simplified as well. Instead of opening up a new email to write your reply you simply start typing inline on the message within the reading pane. Another way Microsoft has streamlined the Outlook 2013 is its new Peek feature. Peek lets you access information in contacts, calendar, or tasks without having to switch over to those modes. When you hover the mouse over the mode buttons a window appears offering a preview of the information within. This is similar to the capability built into the task bar of Windows 7, and it is great to see Microsoft implement a version of this system inside Office. Contacts, renamed People, have received a bit of an overhaul. You could integrate your contacts from sources such as Facebook or Gmail just as with Outlook 2010, but in the past that usually resulted in a muddled contact list full of duplicates. Outlook 2013 introduces People cards that make it easier to store all information about a single person on one card. Email contacts are cross-referenced and consolidated with social media data and other information. Mail Tips introduces features to Outlook that have long been a part of other services such as Gmail. For example, if you use the word “attachment” or “attach” in the body of your message but fail to attach any files Outlook will display a warning. Policy Tips is certain to be a welcome new feature for IT admins. Policy Tips allows administrators to set up warnings that will display automatically if, for example, a message may contain confidential company information or violate company policy. There are a few other small changes in the new version. Weather information is now embedded in the calendar. The search box now has a filter that allows users to choose which folders to include in their search. Outlook 2013 also gives users the ability to minimize the ribbon bar to make the program easier to use with touchscreens. As with Office 2010, Office 2013 will support a 64-bit processors which can take advantage of the larger addressable memory offered by the 64-bit platform. A 32-bit version of Office 2013 will also be available, according to Microsoft. Microsoft Outlook 2013 works much like Outlook 2010, and if you are satisfied with your current version it may make sense to hold off on the upgrade. But if you are planning on using a tablet, concerned with information security, or simply want a quicker and more streamlined version of the Outlook you use now then you should seriously consider upgrading. 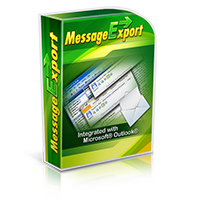 The MessageExport add-in for Outlook has been upgraded to work with Outlook 2013, both 32 and 64 bit versions (64bit is highly preferred because of the large amounts of data that MessageExport often is called upon to process). MessageExport lets you save your Outlook email content in different formats and to different places. If you decide to make the switch and upgrade to Outlook 2013, you can bring MessageExport along with you.